Disney’s 1959 classic Sleeping Beauty serves as the basis for Robert Stromberg’s Maleficent, which, as its title suggests, re-tells its story from the point of view of the story’s villain, the evil Maleficent. Except she’s not really that evil, the movie explains to us. Indeed, the new film’s straying from the rules of its source may prove alienating to some, and perhaps sometimes it does give a back seat to Maleficent’s evil characteristics towards the end of the film, but there are still large portions of Maleficent that succeed, thanks to a powerhouse of a central performance from Angelina Jolie and immensely well done visual effects, where its fantasy world truly comes to life. Linda Woolverton’s script gives backstory to its titular character – Maleficent (Isobelle Molloy as a child, Angelina Jolie as an adult), in her childhood as a young fairy, has an early friendship with a human boy named Stefan (Michael Higgins as a child, Sharlto Copley as an adult), which is unable to continue as they drift apart. Some years later, Stefan, now actively attempting to overthrow the king, betrays Maleficent in his plot, which ultimately proves successful, with a plan involving cutting off and stealing Maleficent’s wings, leaving her flightless. Incredibly jaded by how her old companion treated her, Maleficent curses Stefan’s child, Aurora (Elle Fanning) the newborn princess – on Aurora’s sixteenth birthday, she will prick her finger on a spinning wheel, and a fall into an irreversible coma for the rest of time. I suppose, considering Maleficent’s director, a veteran special effects artist, its massive budget, and its release from Disney, that it’s not much of a surprise to say that this movie looks incredible. The fantasy world created is vastly detailed, sharp, colorful, moody, and thoroughly beautiful. While there are times where some CGI overkill is nearly pernicious to this accomplishment, with some creations coming off as comparatively unrealistic and unfinished (especially in the case of animating three small pixies, played by Imelda Staunton, Juno Temple, and Lesley Manville), the film truly stands out in the field of visuals, with everything from a dark forest to a gigantic fire-breathing dragon breathtaking and wonderful in their own unique ways. When considering acting, Maleficent features good performances from its cast, even when the movie features supporting characters that shouldn’t even have been there (*cough* those pixies *cough*), but the best showing in the film comes from its star, Angelina Jolie. 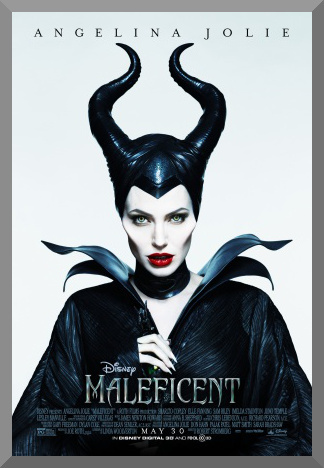 Taking a relatively simple character on paper, Jolie turns in a complex, multilayered Maleficent, hurt from the pain she suffered in her childhood, unable to let what happened to her go, even decades after the fact, but not to the point where the character cannot experience a range of emotions throughout the course of the 97 minute runtime. Jolie’s ability in the role shows a shadow of the greater movie Maleficent could have been, had its tone between light simplicity and dark fantasy violence been smoothed out some, or the evolution of the storyline felt less rushed (as is, the movie more or less abruptly comes to a halt in what feels like should have been around halfway through the final act). Maleficent is a regularly entertaining and competently made take on the established story it comes from, even when working from a mixed bag of a screenplay that, on one hand, benefits from an interesting approach to its main character, but suffers from a rollercoastering tone and uneven act structure. I can see why the movie did so well (it made nearly $250 million domestically when it was released earlier in 2014), and even though its final audience likely moved slightly older, how it could have been/was to an extent a very successful sell for kids aged 7 – 10, despite the action sequences that can push the limit of the now-kid-tuned “PG” rating. Considering how heavily the final product nearly singlehandedly weighs on just two aspects (the work of Jolie and the visuals department), the movie does alright, although far from the more polished, flowing, and appealing levels that could have been reached, and are demonstrated as possible, albeit largely within James Newton Howard’s score and Lana Del Rey’s cover of “Once Upon a Dream” that runs over the end credits.